What remains to be said about John 3:16 that hasn’t been said a million times by millions of priests and preachers? These days, watch any football game on TV and you’ll probably see someone hold up a banner that says John 3:16. That’s what this great Bible verse has become: a slogan, a banner at football games. So I wasn’t going to say anything about John 3:16 today. 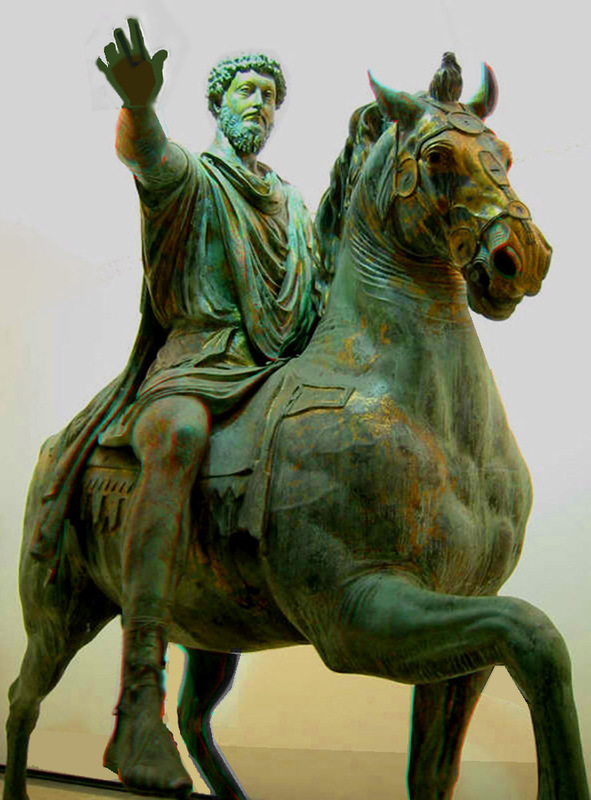 I planned to say something about Marcus Aurelius instead. He was emperor of the Roman Empire (161-180) but is best known for the Meditations, Τα εις εαυτόν, which he wrote in Greek as a journal for himself, for his own self-improvement. But as I reflected on Marcus I ended back in John 3:16 after all. So he tells himself in his journal (7.56): “Think of yourself as dead. You have lived your life. Now take what’s left and live it properly.” Strong stuff to say to oneself. Another day he writes (2.1): “When you wake up in the morning tell yourself: The people I deal with today will be meddling, ungrateful, arrogant, dishonest, jealous and surly. They are like this because they can’t tell good from evil. But I have seen the beauty of good, and the ugliness of evil, and have recognized that the wrongdoer has a nature related to my own – not of the same blood or birth, but the same mind, and possessing a share of the divine. And so none of them can hurt me. No one can implicate me in ugliness. Nor can I feel angry at my relative, or hate him. We were born to work together like feet, hands, and eyes, like the two rows of teeth, upper and lower. To obstruct each other is unnatural. To feel anger at someone, to turn your back on him: these are obstructions (αντιπρακτικόν).” Such wisdom is found throughout the Meditations. As I read more of Marcus, I came upon this phrase (7.67): ὅτι ἐν ὀλιγίστοις κεῖται τὸ εὐδαιμόνως βιῶσαι – “Remember this, that the happy life depends on very little”, or, more simply, you don’t need much to live a happy life. The word εὐδαιμόνως brought to mind ευδαιμονία, the word in Ancient Greek for happiness, well-being, a flourishing life. A happy person is ευδαίμων. I curious so I did a little research and was surprised to discover that the word does not occur in the New Testament. Of course the NT has many words for joy, but the closest that the NT comes to a word meaning happy is μακάριος (makarios) – but almost always in connection with a state of blessedness and always in a theological context, as in the Beatitudes (Matthew 5:1-12). The only people who are just happy with life are presented in negative light – for example the rich fool (Luke 12:13-21) who is content with all he has and tells his soul to eat, drink and be merry. An Ancient Greek would not have thought anything bad about such a man, but Jesus passed harsh judgment on him; for good reason, admittedly. Is it wrong to just be happy? Must everything pass under some sort of divine judgment, standard? Does God look at every moment of our lives, and are we not allowed to just be happy for a bit? Must we always love our neighbor, even when we wish he’d move to another neighborhood? Is it wrong to enjoy something that gives us pleasure? Do we mess up some great universal balance if we just enjoy life once in a while? Can’t we once in a blue moon forget about the neighbor we’re supposed to love? Can’t we be ευδαίμονες in addition to μακάριοι once in a while? The word for a happy man is a combination of the prefix ευ that means good and the noun δαίμων. What is a δαίμων? In the NT and Christian tradition it’s a demon, an evil spirit. But in Ancient Greek it usually referred to the divine spirit in each human being. The ancients would speak of someone’s δαίμων = the spirit that animated his or her life, or the spirit that represented the person’s life and purpose. So, the happy man is ευ-δαίμων = possessing a good spirit that creates happiness in that person. John 3:16 – a great verse. “ For God so loved the world that he gave his only Son, that whoever believes in him should not perish but have eternal life.” But why is the focus always on eternal life? Why can’t I also be happy in this life? The closest that Jesus ever came to saying something like that is when he said “I came that they may have life and have it abundantly (John 10:10).” Now that’s a statement that an ancient Greek or Roman could relate to. And why in the Beatitudes I can only be μακάριος if I’m poor in spirit, pure in heart, meek, peacemaker, weeping, persecuted? Why can’t I also be μακάριος because I love Mozart? Or because I’m a doctor, or a scientist? Why can’t I be ευδαίμων in addition to μακάριος? Marcus also uses the verb ευζωήσεις in one of his meditations (3.12) – another wonderful verb that means live a good life; ευζωέω = to live well. It was always understood by Marcus and all the other Greek and Roman philosophers that to live well also meant to live virtuously. The happy life was also the good, virtuous life. But it was a happy life nevertheless. And I just wish the NT had once or twice incorporated one or more of the words for happiness. We all need some happiness in our lives. 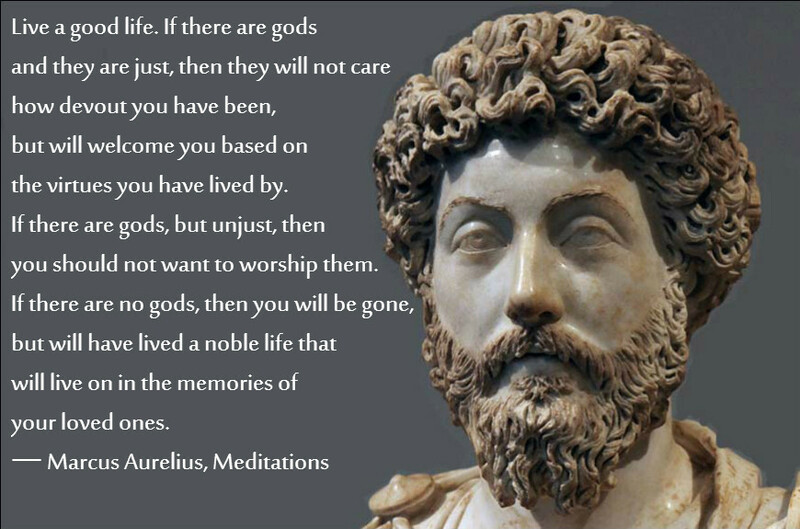 Categories: Sermons | Tags: happiness, Marcus Aurelius, Meditations, Stoic philosophy, the good life | Permalink. I thought about places in the Psalms where there is talk of joy and celebration. Do you think they are relevant to this thought process about happiness?